Taco Tuesday came and went over here and for all of you that are trying to eat healthy – good luck. I am unable to resist the lure of tacos, whether it’s Tuesday or any other day so I figured it was time for me to make a slightly healthier version. Enter the lettuce wrap. It is definitely the friend of sandwich lovers everywhere on a gluten free diet. Also, I bet it is quite popular amongst those cutting calories or carbs. 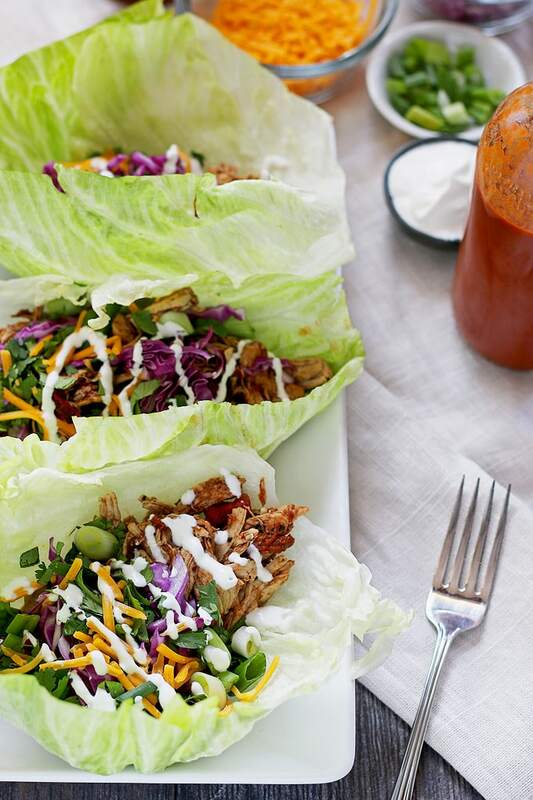 My grilled chicken salad lettuce wraps are so popular that it’s time for their friend, the slow cooker chicken taco lettuce wrap to be introduced to you. 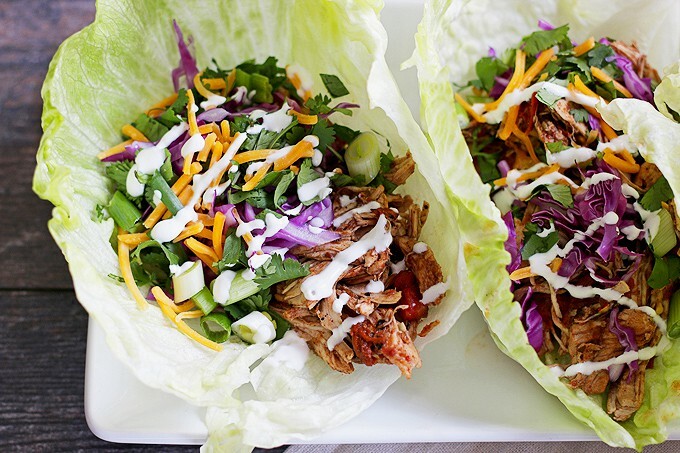 Begin with the slow cooker chicken taco mix. There is so much smoky flavor in this recipe that you won’t even know what to do. Chicken and chipotle peppers in adobo sauce are where it starts. This goes into your slow cooker and then, when the chicken is cooked, you shred the chicken and add the remaining ingredients. Fire roasted tomatoes. Mild green chiles. Garlic, cumin and oregano. When you remove the cover from your slow cooker, the smell will hit you and you may find it intoxicating. I did at least. Luckily, I had already prepped all of my taco fixings, so I was ready to eat. I make my lettuce wraps using iceberg lettuce because it is more sturdy and yet, still can be rolled up a little bit so that your ingredients are contained. I usually trim a little bit of the lettuce leaf so that it’s less floppy. You can dice that up and add it to your taco too. You can use whatever lettuce type you would like – as long as it makes the taco into a wrap, you’ve won. 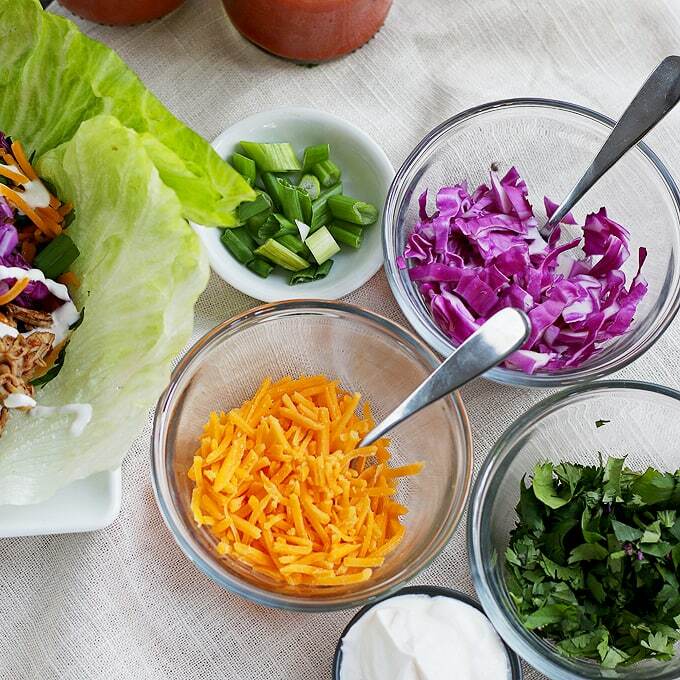 My go-to taco toppings for chicken taco lettuce wraps includes shredded red cabbage, cilantro, green onions, shredded cheddar cheese and a little sour cream. I very sparingly sprinkle on the last two toppings – I believe in moderation but if you decide to leave out the dairy, you will not be missing anything. The chicken itself has so much flavor on its own. This definitely needs to be the next easy chicken lettuce wraps recipe you try! If you’re a fan of PF Chang’s lettuce wraps, I bet you like these better. Just saying…. 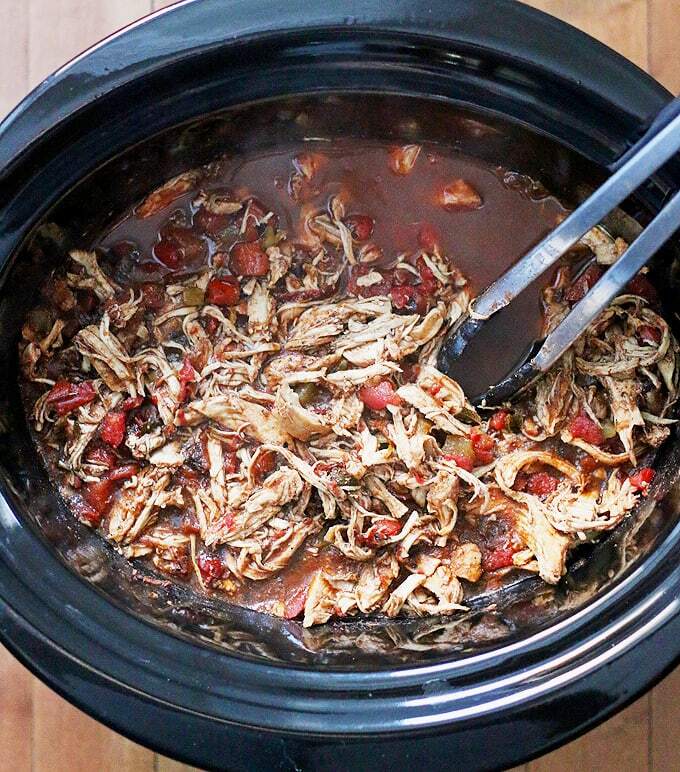 To make the chicken taco meat, place the chicken breasts in the bottom of your slow cooker. Top the chicken with the chopped chipotle peppers and the adobo sauce. Cook on high for 2 1/2 hours. Use 2 forks to shred the chicken and return to slow cooker. Add the fire roasted tomatoes, green chiles, garlic, cumin and oregano to the slow cooker. Stir well. Cook on high for an additional 1 1/2 hours, until the liquid has been slightly absorbed by the chicken. Stir again and salt if desired. Serve hot. 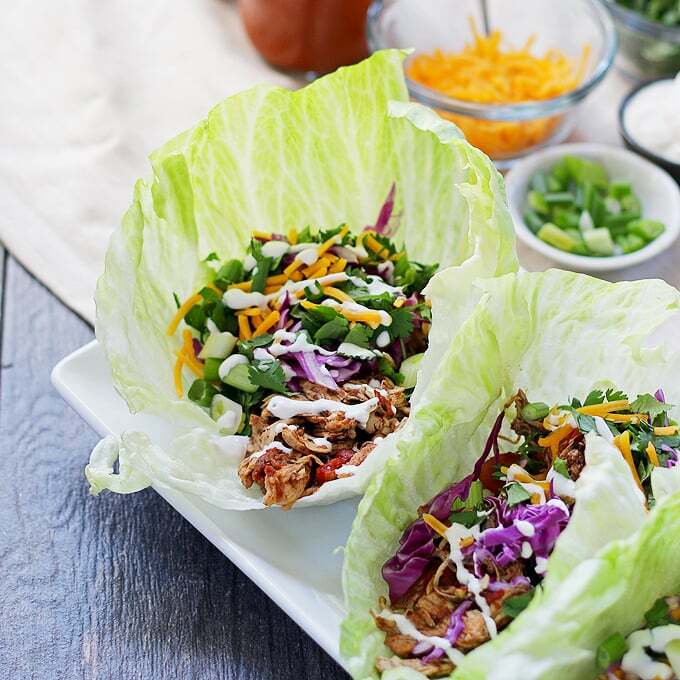 To prepare a chicken taco lettuce wrap, put some of the shredded chicken mixture in the center of a lettuce leaf. Top with your desired toppings, then roll the corners of the lettuce leaf around the taco and eat. 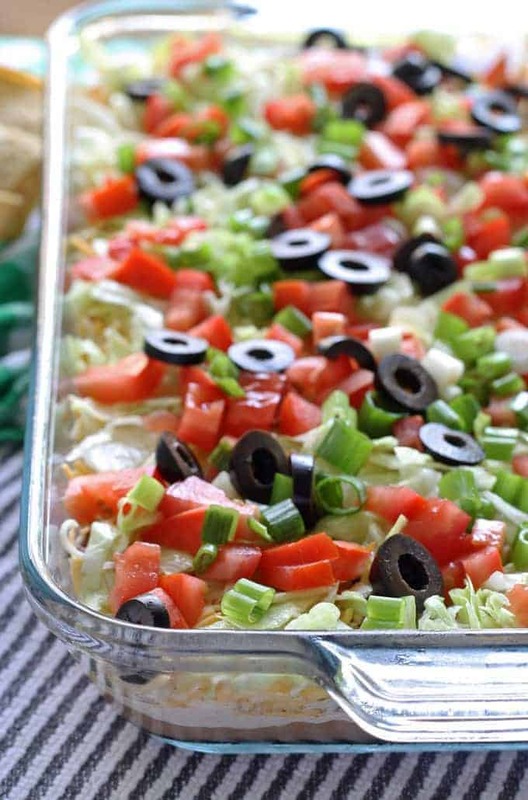 or my slow cooker taco dip! What a great weeknight meal idea! I love that you have substituted lettuce for tortillas for a lighter option! Lettuce wraps are a fav in my family. They are a great healthy choice! Great idea and one my fam would love!! Wow! These look and sound incredible! No one would ever miss the taco shell that’s for sure! hahaha I LOVE those taco shirts you linked to at the end, hilarious! These look wonderful! I can’t wait to try them. Thanks for sharing. We love an easy meal and taco’s are a favorite at our house. We will be making this soon! Pinned and Tweeted to share. Thank you for linking up with us for Snickerdoodle Sunday! I made these and they turned out AMAZING!!! Yay!!! Thank you for circling back and letting me know. Have a great week! This looks soooo delicious, pinning it! Thank you so much for sharing this recipe! What a delicious, healthy dinner- I love using my slow cooker! Pinning! I love slow cooker recipes. Thanks for sharing on the Creative K Kids Tasty Tuesdays Linky Party. I hope you will join us again next week. We love tacos and the day doesn’t matter to us either! I have recently started using crockpot and I love it! It’s just so convenient! This is a great recipe to make a big batch and go through it! Loving the photos they are so gorgeous! This looks amazing – something I definitely want to incorporate into my healthy diet! 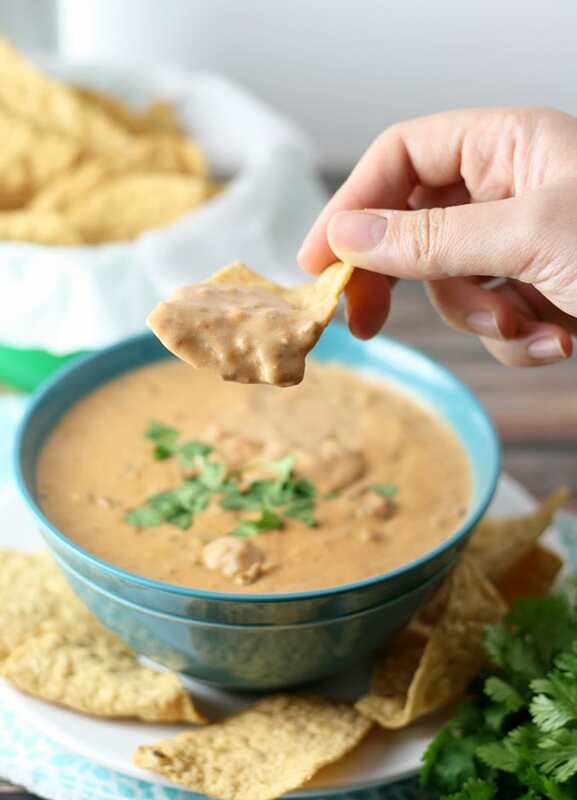 Thanks for sharing your recipe at Inspire Me Monday – you are one of my Featured Guests at this week’s party #212! I made these the other night and they were Fantastic! I went without the cheese, and made a sauce out of the sour cream. I mixed low fat sour cream with some sriracha hot sauce, some honey, and lime juice. Was AMAZING!!! How many servings would the recipe make? Hi Amber – I would say this serves 8-10.